Mid-February found me traveling across the state to New Bedford, the whaling center of Massachusetts to participate in their version of Downstreet Art, their Aha! Night. It was part of their Big Read Project, Stark Raven Mad. 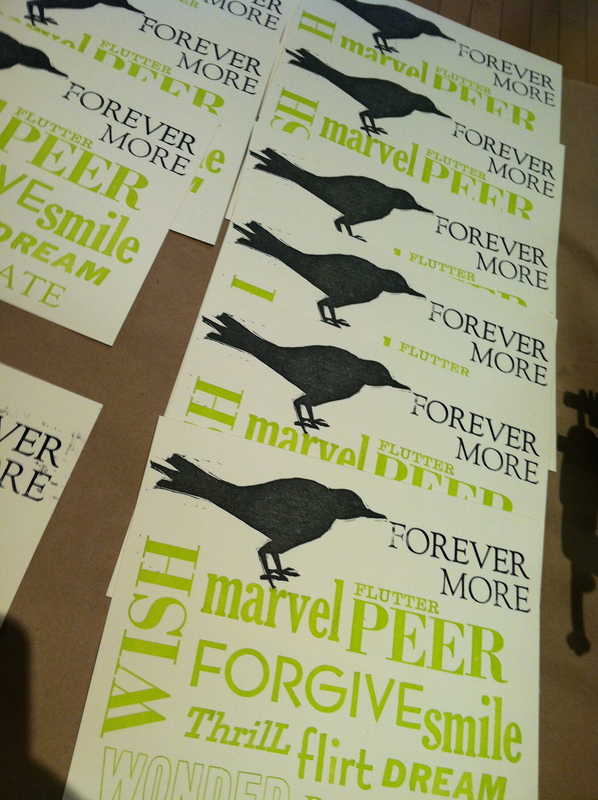 In addition to printing with my mini-presses at the Aha! Night, the Aha! staff put me in touch with a number of other people in New Bedford. We created a mini artist-in-residence. I spent one morning talking to students at UMass Dartmouth, showing them my work and doing a small printing demo. And another morning & afternoon working with fifth graders at two different New Bedford Public Schools. Since the elementary school kids were working on poetry this month, I set a haiku by Basho, that they then printed onto a previously printed bird card. Here are pics of me working with the students. A big shout-out to Peter Pereira, for these great images. For the Aha! Night, I was invited to print something inspired by Edgar Allen Poe’s The Raven. Quite a dark piece of writing, a bit counter to how I create my mantra cards. So how to make it positive, how to make it my own? Aha! Night New Bedford, The Raven-inspired card. Tags: Aha! New Bedford, Basho, Big Read, Edgar Allan Poe, Forevermore, The Raven. Bookmark the permalink. Previous post ← What’s your Mantra?